WASHINGTON — After the Egyptian army issued a 48-hour ultimatum for the opposition and the Muslim Brotherhood-ran government to meet, Muslim Brotherhood head and current Egyptian President Mohammed Morsi refused to honor the ultimatum. Reuters reports  that Morsi released a statement at 2. a.m. on Tuesday and said he had not been consulted before the army issued their ultimatum and therefore would be following his own plan to bridge the gap between his Islamist Muslim Brotherhood and the secular and liberal opposition protesters. 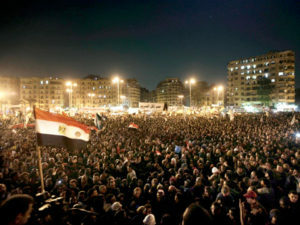 U.S. President Barack Obama has only offered some support for Morsi and told the protesters to talk out their problems  with Morsi. Much of the dissent comes from the secular liberal opposition, who fear Morsi and his Islamist Muslim Brotherhood are trying to Islamicize the country, after pushing an Islamist constitution last year and after Morsi tried to grab more authority while circumventing the country’s independent judiciary . That, and a struggling economy that is relying on a several billion dollar aid package from the International Monetary Fund , has created this new wave  of protests of millions of Egyptians , some of whom that Morsi called the “enemies of Egypt “. Many of his ministers have already resigned, with up to six as of Tuesday. The cabinet’s spokesman also resigned. To add further insult to injury, the Egyptian courts upheld the striking down of Morsi’s appointment to the office of the prosecutor general from last year.